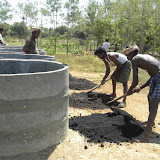 ODAM’s Terra Preta (Biochar) Project encourages farmers to use a nutrient-rich compost made of charcoal, biomass, and water to increase the quality of local soil. 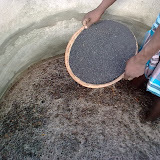 This terra preta (“black earth”) mixture improves soil fertility, water retention and plant yield far beyond what is possible with nitrogen fertilizers. 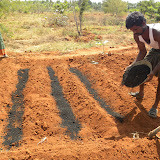 The Terra Preta Project offers farmers new economic opportunity in the production of biochar, the application of biochar to yield better crops, and simultaneously helps in the afforestation of areas overrun with the destructive weed species, Prosopis juliflora. The project is also a closed-loop carbon sink, where the use of charcoal improves the soil while also converting carbon dioxide through the plants’ photosynthesis cycle. Currently, ODAM is testing crop yields based on the use of different types and proportions of biomass and charcoal powder. With the support of the Siemenpuu Foundation, ODAM has been able to conduct terra preta trials to test the viability of various terra preta mixtures as fertilizers for its crops in ODAM’s Nursery Garden.